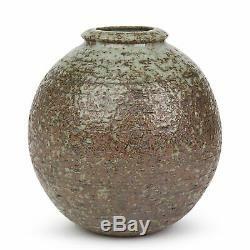 VINTAGE SCANDINAVIAN GREY GLAZED STUDIO POTTERY VASE 20TH C. Height 22,5cm, Diameter 20cm. Scandianvian, possibly Gunnar Nylund incised mark to base. 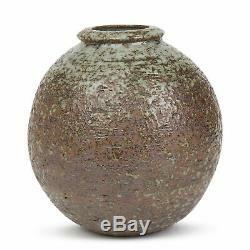 A stylish vintage Scandinavian studio pottery vase of rounded bulbous shape attributed to Gunnar Nylund. 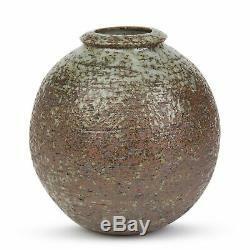 The rounded stoneware vase has a cut rounded top and is constructed from a textured brown clay with incised trailing designs and applied with splashed grey glazes. 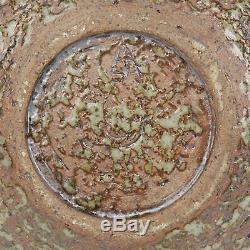 The glazes are also splashed to the base over an incised artist mark. We cannot and will not declare items below the sale value. Hidden in amongst the beautiful countryside of Hertfordshire, in a large 17th-Century converted barn, is one of the UKs best kept secrets Xupes. We are the home of pre-owned luxury. We pride ourselves on our excellent service and our vast curation of watches, jewellery, handbags, design & art. We're a family run business with a young creative team, striving to redefine the stereotype of second hand, breathing new life into every item we sell. From the initial stages of authentication, right through to refurbishment and quality control, each item is rigorously tested and only the very best make it into our collection. Our entire team is dedicated to achieving the highest standards of quality and care, hoping to exceed your expectations in every way. In addition to our fantastic online shopping experience, we welcome visitors to our renowned show space The Wonder Room. Located at our period headquarters, The Wonder Room is an exclusive space where you can view our range of luxury pre-owned products in person and receive expert advice from a member of our team. We look forward to welcoming you to Xupes in the near future for a glass of Champagne or a cup of freshly brewed coffee. Watches At Xupes we know that purchasing a pre-owned luxury watch online can be daunting. We ensure that every pre-owned watch that comes to us is transformed back to its best possible appearance and performance before being added to our collection. All of our watches are fully inspected by our highly skilled and dedicated watchmakers in our accredited service centre which is equipped with state-of-the-art tools and machinery. Our commitment to excellent customer service and our in-house expertise ensure you an unforgettable experience when shopping with us. Jewellery When purchasing jewellery from us here at Xupes, you can be assured that every piece is hand-curated for our collection and is checked by our in-house specialists to ensure authenticity. As a team we have a wealth of experience within the industry. We are members of the National Association of Jewellers (NAJ) and have a team of trained Gemologists. We ensure that every piece of jewellery that comes to us is transformed back to its best possible appearance before being added to our collection. Handbags We understand that purchasing a pre-owned handbag online can be daunting. You can be assured that every item is carefully selected for our collection and is checked by our experienced in-house specialists to ensure authenticity. All of our items are precisely described and complete with studio images, meaning you can shop with complete confidence. Art and Design At Xupes we handpick our items from all over the world using our expert knowledge. As a team we study the markets to make sure we provide the most interesting and sought-after items at competitive prices. Here at Xupes, you can be assured when purchasing from us that every piece is carefully selected for our collection and is checked by our in-house specialists to ensure authenticity. We are also proud members of The Association of Art and Antiques Dealers (LAPADA). If your order is placed after 3pm we will dispatch your item(s) to you the following day. If your order is placed before 12pm (GMT) your item(s) will be dispatched on the same day. We aim to get your item(s) to you as quickly as possible. You must comply with all laws and regulations of the country in which you are receiving the Goods. Collect in Store Our convenient and complimentary Collect in Store service is available at our Hertfordshire showroom. You can collect your items at a time that suits you. Goods may be collected by appointment only from our offices for security reasons. Xupes is committed to the quality of our items and the satisfaction of our customers. We are not liable for the cost of such methods. We cannot accept the return of items that have been engraved, altered or personalised. 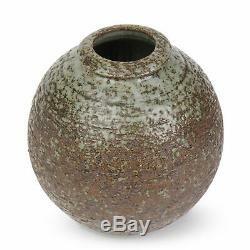 The item "VINTAGE SCANDINAVIAN GREY GLAZED STUDIO POTTERY VASE 20TH C" is in sale since Thursday, March 28, 2019. 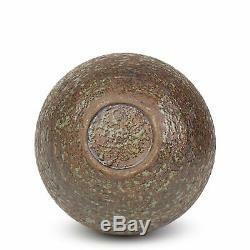 This item is in the category "Pottery, Porcelain & Glass\Pottery\Studio". The seller is "xupesartandantiques" and is located in Hertfordshire.